There’s an updated version of this guide available on our Knowledge Base. 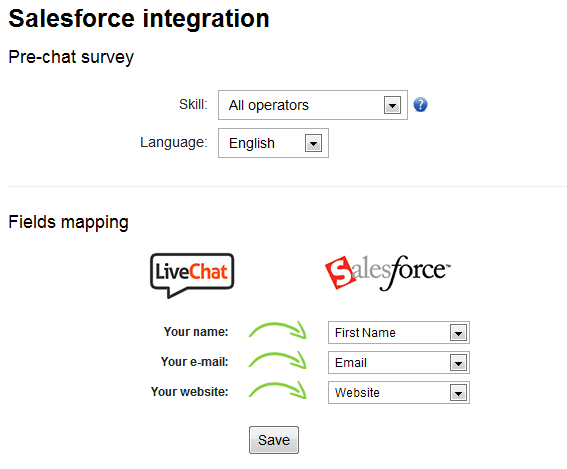 If you have integrated your Salesforce or SugarCRM with LiveChat, you can easily map pre-chat survey fields to their CRM equivalents. When you create a new record (such as a Contact or an Opportunity), the mapped fields will be automatically saved in your Salesforce/SugarCRM. To map your survey fields, just visit the Add-ons & Extras page in the control panel and manage your CRM integration.